The flip side of life often goes unnoticed. They say a mark of a good photograph is its ability to convey not just the message but also its various hues. 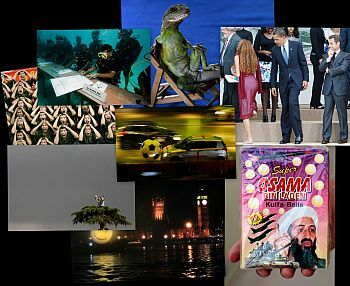 rediff.com has listed some odd moments captured through 2009. Let your imagination run riot on this one. United States President Barack Obama and France's President Nicolas Sarkozy take their places with junior G8 delegates, including Brazil's Mayora Tavares (left), for a family photo at the G8 summit in L'Aquila, Italy on July 9, 2009. 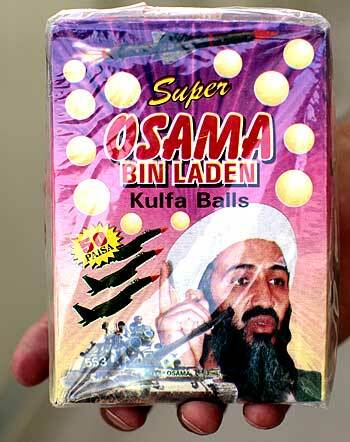 A man holds a box of Pakistan-made 'Super Osama Bin Laden, Kulfa Balls' milk and coconut flavour hard candies bought at a bazaar in Kandahar city. 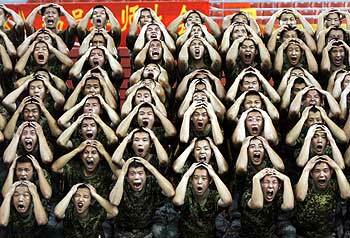 People's Liberation Army soldiers perform during a rehearsal of a musical drama entitled 'The Road of Revival' at a gymnasium in Beijing on August 19. The musical drama is part of celebrations for October's 60th anniversary of the founding of Communist China, with the highlight being a massive parade by the PLA through the centre of Beijing. 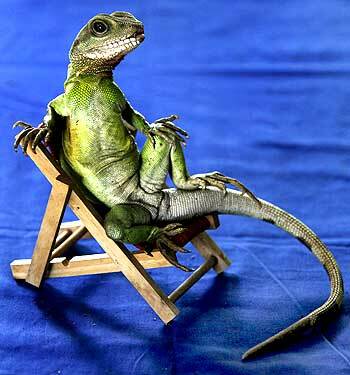 A one-year-old water dragon poses in a chair during training by her owner in the outskirts of Bangkok on September 10. Santisak Dulapitak has been training his animals to appear in advertisements and movies for more than two decades. 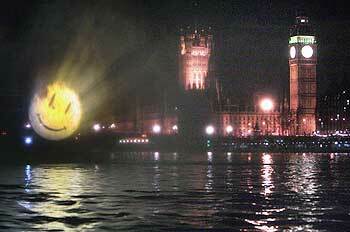 A logo to promote the film The Watchmen is projected onto fine spray water screen over the River Thames near to the Houses of Parliament in London on March 4. 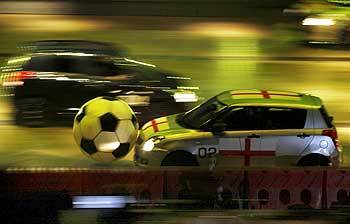 Cars take part in an automobile soccer match during a demonstration of Top Gear Live before its performance in Hong Kong on February 19. The British TV show was holding its first Asian tour to the territory. 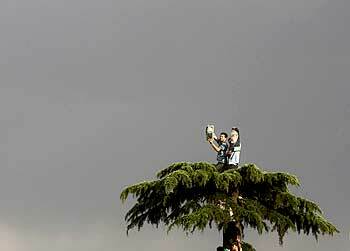 Men hold campaign posters as they sit atop a tree during a rally in support of defeated Iranian presidential candidate Mirhossein Mousavi in Tehran on June 15. Maldivian Minister of Fisheries and Agriculture Ibrahim Didi signs a declaration calling on countries to cut down carbon dioxide emissions ahead of a major UN climate change conference in December, in the Maldives, October 17. 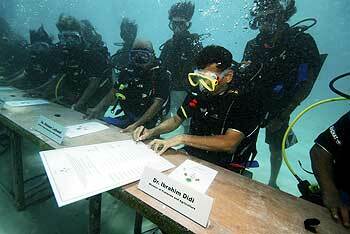 The Maldivian president and ministers held the world's first underwater cabinet meeting, in a symbolic cry for help over rising sea levels that threaten the tropical archipelago's existence.